Nobody wants to spend their holiday looking over their shoulder, but it's a fact of life that tourists are considered 'easy pickings' by locals in many countries, and the added threat of credit card scams and identity theft overseas make it imperative that you give some thought to avoiding disaster on the money front while you're away. What should you take away with you? Well, you don't want to be left with no way of getting your hands on your money if the worst does happen and you're a victim of crime, so take a mixture of cash, travellers cheques and cards away with you - and don't keep them all in one place! You'll need to have some local currency for food, drink and local travel when you arrive. Keep any cash close to you, on an inside pocket or a money belt. Don't bother with a 'bum bag' because they are probably the number one thing that will set you apart as a tourist and make you the perfect choice for an opportunistic criminal. The less obvious it is that you're on holiday, the better. If you carry a handbag, wear it on a strap across your shoulder, and make sure you walk and keep one hand on the strap to protect yourself further. Thieves are looking for the easy option and if they see it's likely to be a struggle to get the bag from you, they will probably move on to someone else. Don't keep all of your cash in the bag, so that if it does get stolen, you have a back up reserve. And keep cards and cash separate! 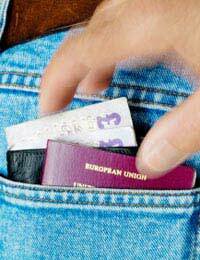 If you have a wallet, keep it in your front trouser pocket and not in the back - for obvious reasons. Some people also keep a spare stash of cash in a sock or shoe just in case. Travellers cheques are a cheap and reasonably safe way to take money abroad, and they are convenient too as they can usually be cashed in at most hotels, banks and bureaux de change. If you lose them, or they are stolen, you can claim against the issuer, so they are a good bet for the forgetful, too! Be careful with credit and debit cards when you're overseas - not only are they not always accepted, but you could find yourself saddled with extortionate bank charges for daring to take some of your own money out of your bank account in a foreign country. As a rule, credit cards tend to be more widely accepted than debit cards - some countries are behind with their technology and haven't quite got the hang of the debit card idea yet. The bonus is that if you have a card stolen you can contact the issuer and have it stopped, avoiding losing too much money. For this reason, always keep a note of the 'stolen card' number - and keep it separate from your wallet or wherever you keep the cards. As soon as you realise it's gone, get on the phone and have it stopped. When you're taking money out of an ATM in a foreign country, be vigilant. Look out for anything unusual, and anyone lurking around looking suspicious. Don't take large amounts of cash out if there's someone else hanging around, and when you type your PIN number in, guard the keypad with your hand to avoid anyone watching as you type the number. It goes without saying that you should always be on the lookout for credit card fraud when you're away from home. The banking payments body APACS said in 2007 that fraud abroad had risen by a staggering by 126% in the first half of the year, compared with the same period in 2006. Scams include double charging (the seller makes a 'mistake' and asks you to re-sign to slip) adding a zero to your bill at the end of a meal, and card skimming. Never let your card out of your sight, and always be vigilant with bills. If you suspect anything, contact your card issuer immediately, and check your credit card bills when you return for any obvious anomalies. Hopefully your holiday will pass without incident and the only money regret you will have is buying that tacky straw donkey...but keep an eye on your cash and you'll be glad that you did! Overcharged When Withdrawing Cash Abroad?